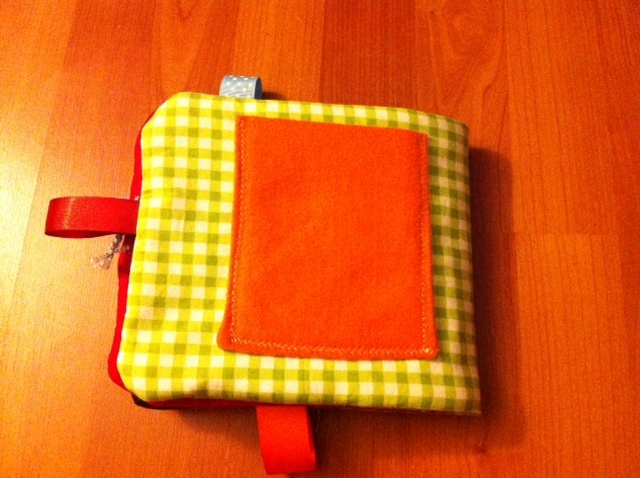 A couple years ago, I decided it was time to dust off the sewing machine and actually put it to use. That year I made lots of potholders, but not much else. I wanted to make thing people would use and it turns out useful items are a LOT harder to make than non-useful items. Or so I thought. I dug a little deeper and got a little braver and stretched to coffee cup sleeves (would people just make all coffee cups the SAME SIZE, please?!) and pajama pants! That was exciting. But really hard so I’m avoiding making any more. 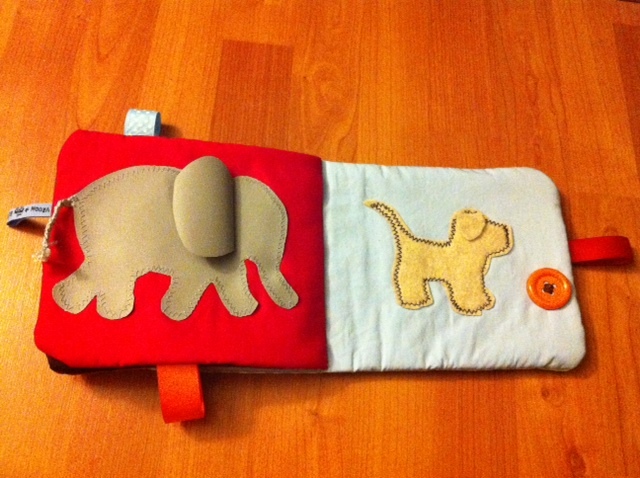 The thing I really wanted to make, right from the start, was a cloth book. I mean, come on, I’m a children’s librarian. Duh. Every time I saw them there were so many pieces and everyone had a different technique for joining the pages, and on and on until my head was spinning. Well, almost exactly a year ago one of my good friends (and also a rockin’ children’s librarian) had a baby! I knew she’d be the perfect guinea pig for my first ever baby book. I did some research and made up a lot of stuff along the way, but eventually got it done. I was proud of it, but so paranoid that the seams will rip or the bells will come off or I missed tying off something somewhere. So with my second attempt (there are so many babies coming right now I think I’ll get lots of practice! ), I employed the KISS technique. Keep It Simple Stupid. Plus, babies love simple shapes and touch and feel. That’s enough. 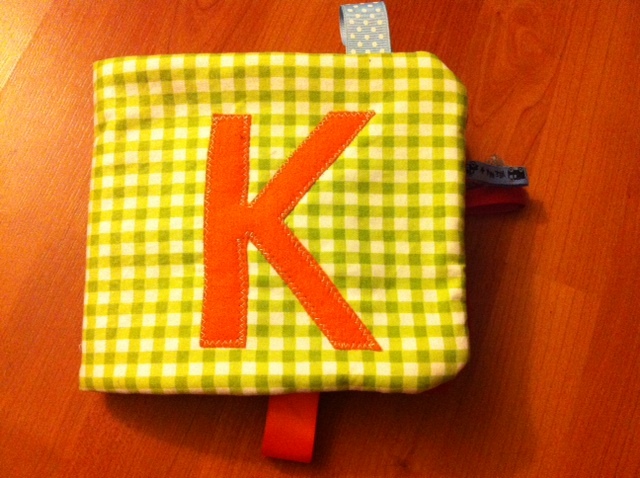 It doesn’t need to rattle, zip, and all that (though I’m totally going to make some of those for toddlers). And the best part is it really only took about 3 nights worth of work. 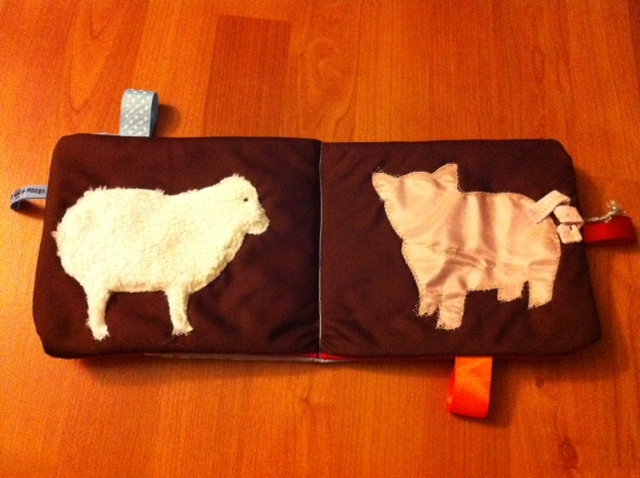 I cut everything one night, pinned and sewed the animals another, did the cover, embellishments, and binding on the last. Best part: the whole project cost me about $5. 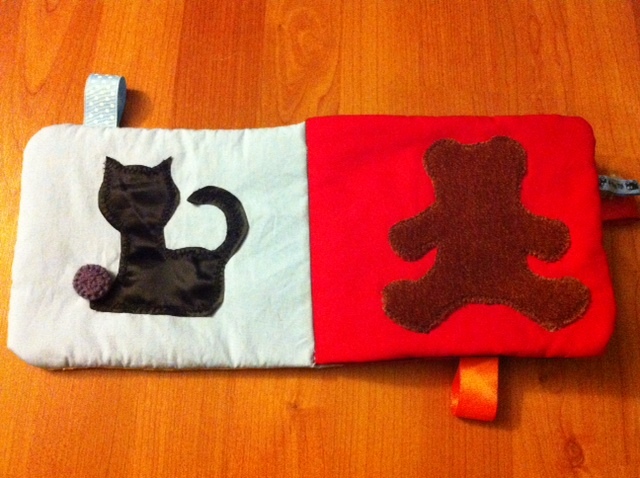 I went to fabric stores and purchased remainders to make the animals and remainder batting for the padded pages. We have a great shop in Portland called SCRAP and they have bins and shelves of scrap fabric for super cheap. I can find all kinds of colors and textures and I don’t have to buy a 1/4 yard at the fancy craft stores (if they even have the colors and textures I want!). 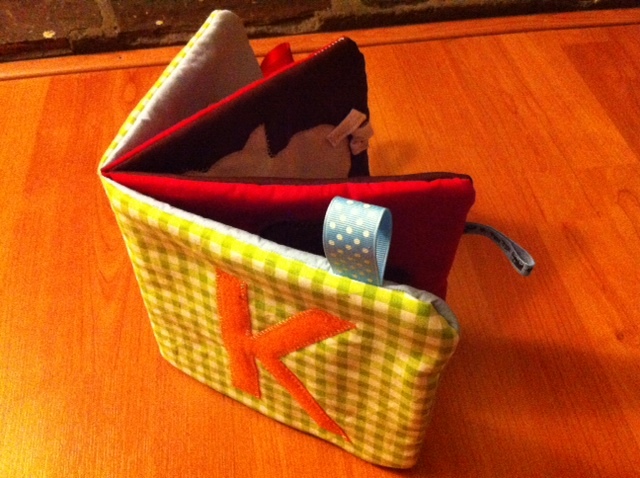 They also have other things for embellishing like big buttons, ribbons, zippers, needles and thread and more. Such a great place! Every city should have one. For those wanting patterns, etc. I just found clip art images that I liked the basic shape of and traced their outline on to the fabric to match. The cat and K were free-handed. I’m going to try to work up instructions all fancy-like but for now, here are some of the sites I ran to for inspiration, logistics, and more. Lella Boutique made a super cute baby boy texture book. She’s uber talented, people. Invisible seam!!! YES! Couple of tutorials for that here and here. I ultimately ended up staring at the second one (Quilt Taffy) while actually sewing the seam closed. But that’s really just because it’s the one that opened first on my phone. They are both excellent. Categories: Other Library Stuff | Tags: books, sewing | Permalink. Great job! I can’t wait to see N try out the book the Flannel Friday crew made her. I should let her have a go soon. Thanks! And yea, let her at it! I’m sure everyone wants to see pictures of it getting “loved”.